I don't have a bottle of this to show since I finished up my last one on vacation, but a similar option (but not better) is the Vita Liberata Mousse, which you can see swatched above. These mousses must be applied with a mitt (like this blue one) to achieve an even tan. This stuff dries quick! Go one pump at a time and work in small sections of the body so you don't get streaks. Mousses have a colour guide, meaning they provide an instant tan, which must be washed off at least 4 hours after application. Take note that the colour guide will transfer onto white clothing or sheets, but can be washed off. Avoid silk and polyester since they will stain. It's also important to shave, exfoliate and moisturize before applying your mousse tanner. 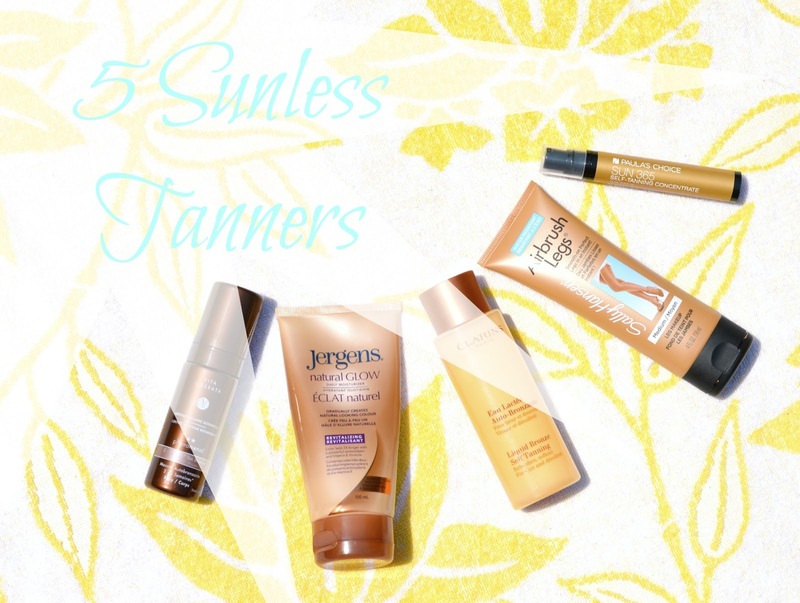 I can get around 5 days of tan from one application. Wash the mitt with mild soap and warm water to leave it fresh and free of bacteria. I love using Dr. Bronner's Magic Soap in peppermint. A similar product is available from Paula's Choice, found here. This is a clear yellow gel (see swatch above) recently launched by one of my favourite skincare brands, Paula's Choice. I haven't tried it for long enough to give a confident seal of approval, but I'm loving the small bottle and smell-free gel which amps up your normal moisturizing routine. One pump of this lightweight gel can be added to any lotion for a sheer, natural tan. UPDATE: When I say sheer, I mean barely there sheer. I'd skip out on this one and maybe try Clarins Glow Booster for a moisturizer add-on tanner. Weird name, killer product. I use this very thin, milky liquid once per day to maintain the perfect sun kissed glow on my face and neck. I don't use any other tanner on my face since all the other ones seem to clog my pores. I'll wash, tone (with a few sprays of Thayer's Witch Hazel), lightly moisturize then smooth on a thin layer of this tanner, avoiding the eyebrows and upper lip. It has a light fragrance and gorgeous silky finish. It leaves my skin free from breakouts and one $30 bottle lasts forever. Please, just try it. You won't regret it. Body makeup! It works! This stuff makes your legs look divine. I haven't used it all over, simply on arms and legs to give an extra boost. I mix a bit with my body lotion and blend it all in. It doesn't seem to rub off on clothing and provides natural-looking colour, especially when sheered out with a lotion. The tube can get a bit messy, but for $10 or so, it's worth it. Finally, the legend. Natural Glow is my go-to lotion tanner for a quick tan for the body. It smells like cookies and can look a bit streaky if you don't rub it in well enough, but overall, a drugstore steal. 1. Failing to exfoliate your skin before application will almost always result in an uneven tan. I love applying my regular body wash with exfoliating gloves, like these from The Body Shop, which you can also find at most drugstores and dollar stores. 2. Don't forget to apply a teeny bit of product to the tops of hands and feet for the most natural colour. Really blend around ellbows, knees, neck and ankles. Believe me, the results will be quite silly if you go over those areas too quick. 3. WASH YOUR HANDS. Palms, between the fingers, wrists, and especially the cuticles. Wash with soap and water, then do a quick detailed clean with rubbing alcohol. Don't neglect them. You'll look like a loonie for at least two days if you forget to scrub them down after applying tanner (unless you use a mitt). To help eliminate the orange hands altogether, layer on some moisturizer beforehand to limit the amount of tanner that gets absorbed into your skin. C'est tout! 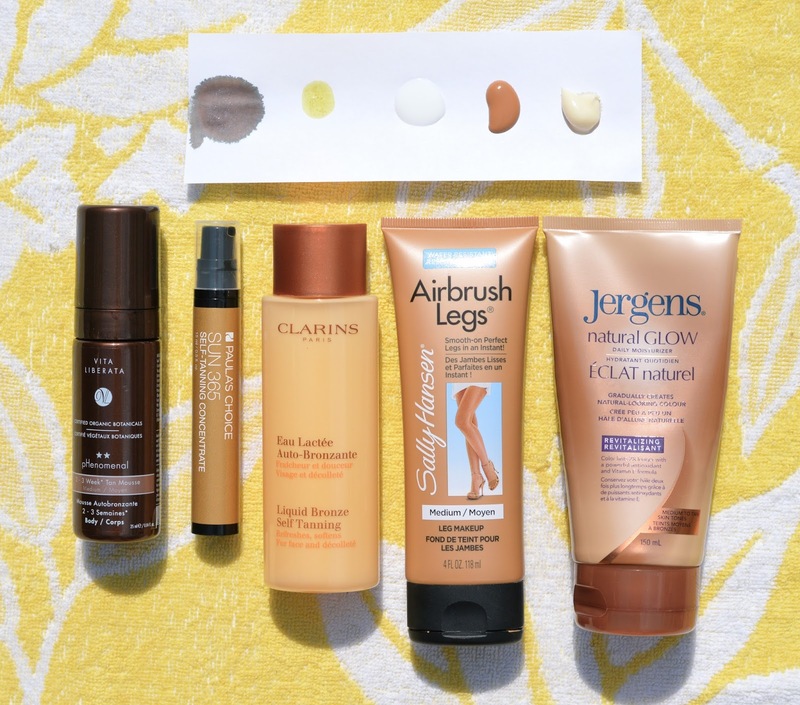 This might sound like a nightmare to some, but nailing down a good self-tan regime is well worth it. Because in the end, skin cancer seems like a bit more of a nightmare, am I right?